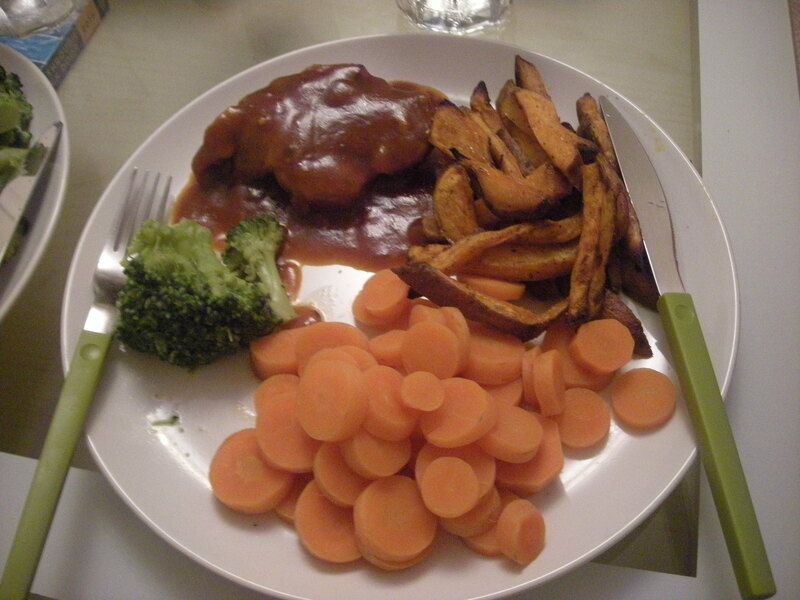 We had ours with broccoli, cooked carrots, and sweet potato fries. Yum! I love pork. Apparently it isn’t usually people’s favourite meat, but I have to say, I could eat it everyday. Pork and chicken. Mmmmm…with mashed potatoes…with any potatoes…with anything… Sorry. Sweet BBQ Pork Chops. Right. I love this sauce recipe. It’s really easy to whip up, and it’s really impressive. You could really use it for other meats as well, or for other cuts of pork. It’s just that good. In a large skillet, heat your oil. Brown the pork chops for 2 to 3 minutes on each side. You will probably need to do this in batches, unless you have some astronomical skillet. Mix remaining ingredients and pour over chops. Bring to a light boil. Reduce heat, then simmer, covered, for 4 to 5 minutes. Let stand for about 5 minutes before serving (to let the sauce get all up in the pork). This entry was posted in Recipes and tagged BBQ, pork chops, recipe. Bookmark the permalink.